Chicken Tikka Masala, Beef Bulgogi, and Ceviche all have one thing in common: each protein is marinated, which contributes to the development of flavors and textures in the final dishes. The use of marinades is common across all cultures, and can provide a unique kick to food when done correctly. Marination is the process of immersing foods in a liquid often made with oil, seasonings, and an acid or enzymatic component, to flavor and tenderize food. 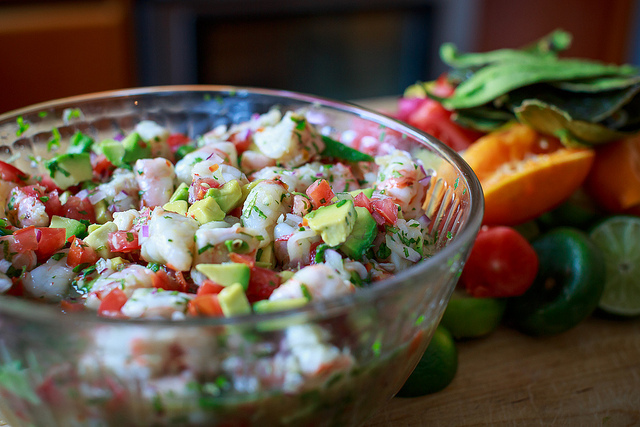 This liquid is called a marinade, and the term originally came from the use of seawater to preserve meat. The roots of the word are derived from the Latin word for sea (mare) . To understand the importance of marination, we must first address the components of raw meat. Consider tough, lean cuts of meat such as shank or flank. Meat toughness is related to the collagen and elastin fiber content in its connective tissues. One way to tenderize lean meat is with moist heat, as this breaks down stiff collagen proteins into soft, soluble gelatin . Gelatin is responsible for that silky, falling-apart texture and mouthfeel ; this can be achieved with braising and stewing, where meat is simmered in liquid at a low temperature, allowing collagen to dissolve starting at 160º F. However, this conversion process can take some time, even up to 72 hours. Another reason to pre-tenderize meat before cooking is to prevent dried out meat: moisture is lost when heat is applied (despite being cooked in liquid). This is where marination comes into play, as it provides another opportunity for protein breakdown. This method can thus shorten subsequent cooking time as well as minimize moisture loss as less heat is needed to “cook” the meat. Two types of marination include acidic and enzymatic marination, which both help break down the connective tissue in the meat. Acids, such as lemon juice or vinegar, work by denaturing proteins through disruption of hydrogen bonds in the collagen fibrils. Adding alcohol can also supplement the penetration of acid marination since fats present in meat are soluble in alcohol . Beer and wine thus make great marinades, and they also confer their own tenderizing agents (tannins). Be careful not to overmarinate the meat, as prolonged exposure to acid can cause it to become tough. This occurs because after the proteins are denatured, they tighten as water content decreases . Some marinades involve milk or yogurt since they have lower acid content. Enzymes increase the rate at which cellular reactions occur, and certain enzymes help attack the protein networks of tough meat. Proteolytic enzymes such as fungal amylase (in legume seeds) and protease (in ginger) help break down muscle fiber protein into its constituent amino acids. 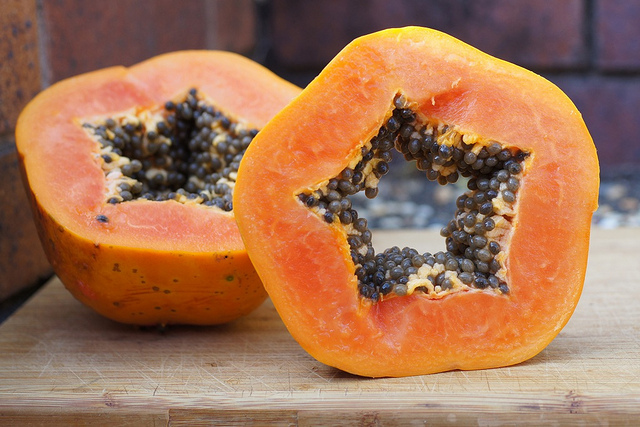 Enzymes from tropical plants such as bromelain (in pineapple), papain (in papaya) and ficin (in latex of fig tree) break down collagen and elastin . In fact, natives of pre-Columbian Mexico used to wrap their meat in papaya leaves before cooking since they found that it increased tenderness . However, be sure to monitor the time of marination, for the enzymes can completely digest meats if they sit for too long. Another factor to take into account is the amount of contact the meat has with the marinade. Marination is a process of adsorption, where the marinade adheres to the outer surface of the meat rather than absorption, where it would penetrate all the way through . This has resulted in some controversy over whether acidic and enzymatic marinades actually tenderize meat or not, but there are ways to alleviate this problem. It may be helpful to use thinner slices of meat to enhance the marinade penetration and reduce marination time. For thicker cuts, marinades can be injected to increase contact surfaces. Adding salt also helps, as it first draws out liquid by osmosis; then the resultant brine is reabsorbed into the meat while breaking down muscle structure. The brine draws flavors further down below the surface . Fat such as oils are also useful to transfer fat-soluble flavors from the seasonings into the meat. In general, tender cuts of meat should not require as much marination time as tougher cuts, and fish require even less time. 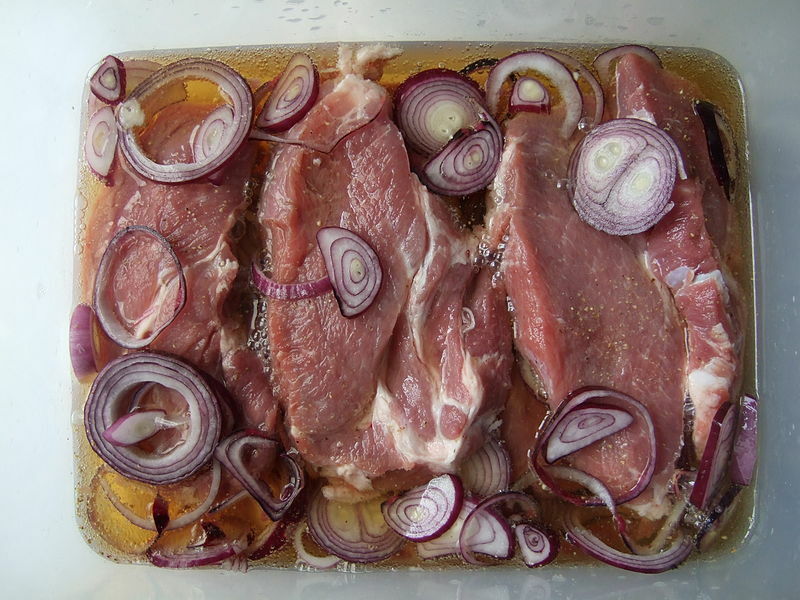 Marinated meats should also be refrigerated to prevent harmful bacterial growth. Although it may seem a hassle to prepare ingredients for a marinade and remember to apply it to the meat for a certain time beforehand, the results can be well worth the wait. Some Surprising Facts About Marinades and the Origin of the Word. CulinaryLore. Science of Slow Cooking. Science of Cooking. Juáres, M., Aldai, N., López-Campos, Ó., Dugan, M., Uttaro, B., Aalhus, J. Beef Texture and Juiciness. Handbook of Meat Processing. January 2012. Alarcón-Rojo, A. Marination, Cooking, and Curing: Applications. Handbook of Poultry Science and Technology, Secondary Processing. February 2010. Saucy Science: Exploring the Science of Marinades. Scientific American. The Food Lab: More Tips For Perfect Steaks. Serious Eats. About the author: Catherine Hu is pursuing her B.S. in Psychobiology at UCLA. When she is not writing about food science, she enjoys exploring the city and can often be found enduring long wait times to try new mouthwatering dishes. Researchers at the American Academy of Microbiology answer the FAQs of cheese-making and Carl Friedrich Gauss, a famous 19th century mathematician, explains the best way to hold a pizza slice–using math, of course. Want beer foam that doesn’t dissipate right away? 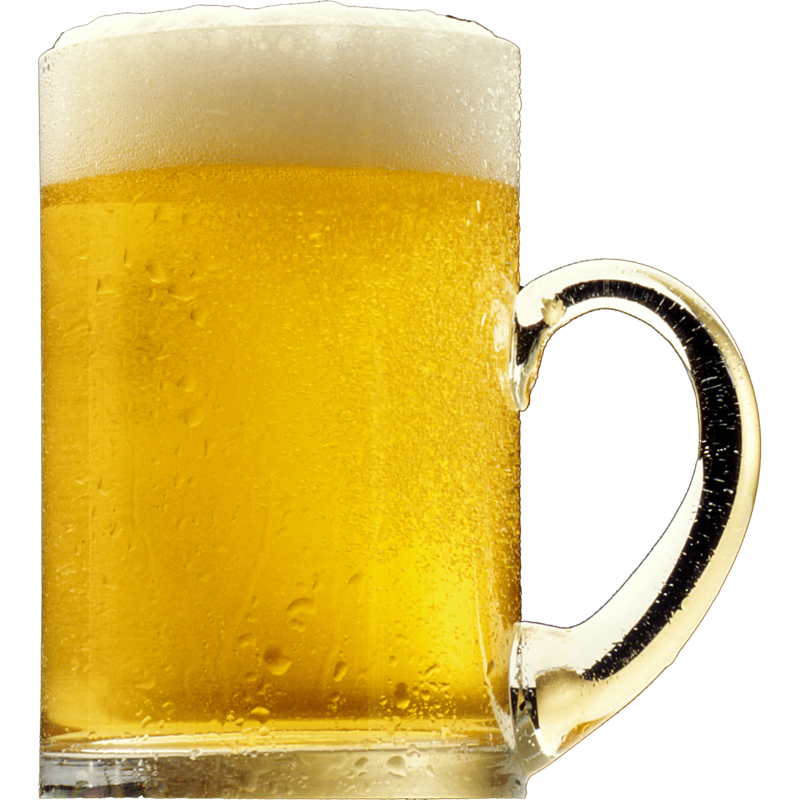 Microbiologist Tom Villa made a genetic discovery in yeast that could create beers with longer-lasting beer foam. 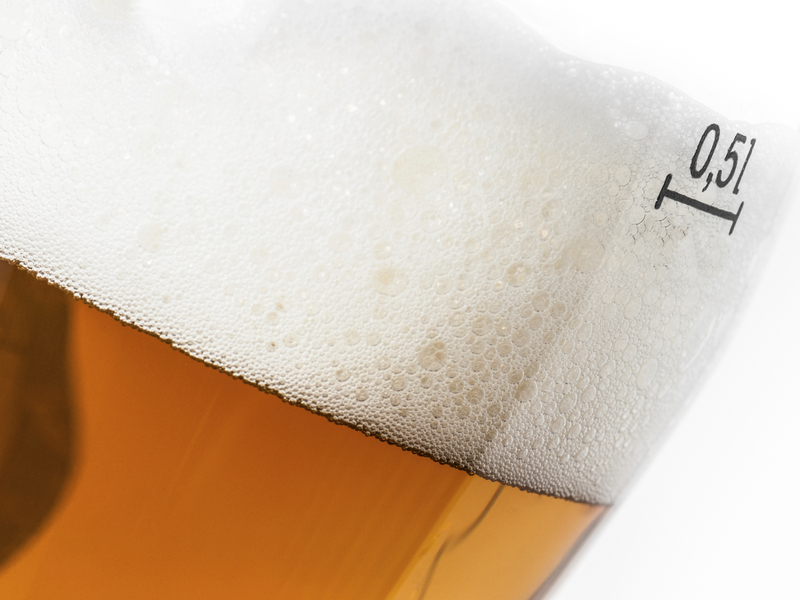 This yeast, however, doesn’t quite affect the taste, so find out where beer flavor comes from. 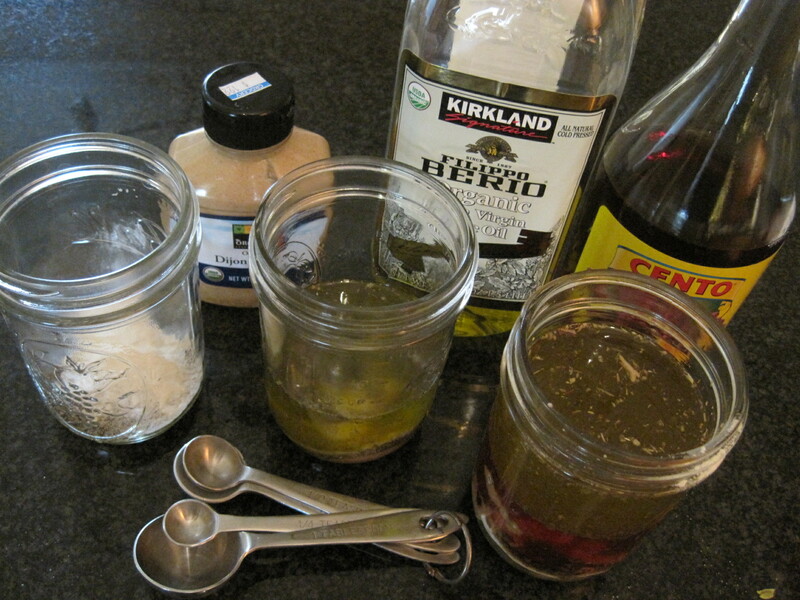 Homemade vinaigrettes are about as easy as they look: mix oil, vinegar, and spices; shake before pouring. For those who want vinaigrettes without the inelegant step of shaking before serving, the solution is simple; add an emulsifier. Understanding the role of an emulsifier first requires some familiarity with the primary components in vinaigrette, vinegar and oil. Vinegar is composed of acetic acid and water, which are polar compounds. In a polar molecule, one or a group of atoms have a stronger pull on the electrons in the molecule. Due to this uneven share of electrons between the atoms, weak charges form on opposite ends of the molecule [Figure 1a]. The weakly positive and negative charges on the polar molecule are called dipoles. Oil, on the other hand, is a type of lipid, which is a nonpolar compound. Since the atoms within the lipid are largely identical, the electrons are evenly distributed across the lipid molecule [Figure 1b]. 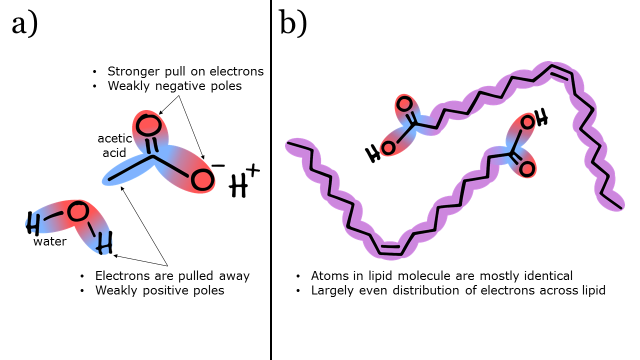 Therefore, nonpolar molecules do not have such well-developed dipoles. Figure 1. a) Acetic acid and water are polar molecules. b) Lipids are nonpolar molecules. 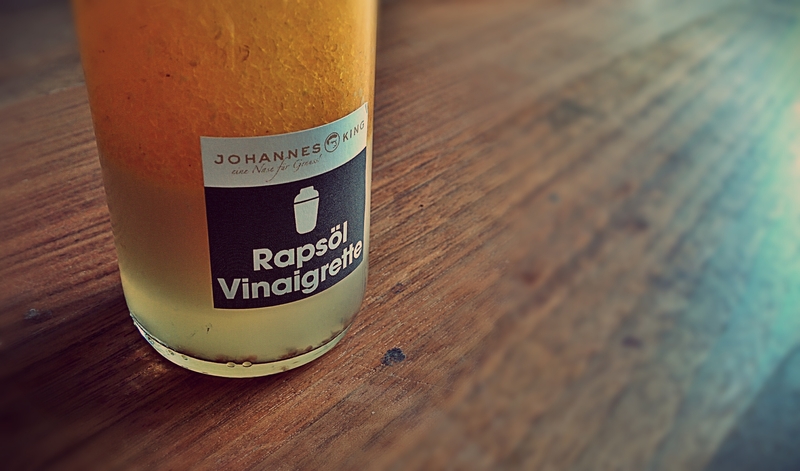 To prevent phase separation, an emulsifier can be added to the vinaigrette to stabilize the emulsion. 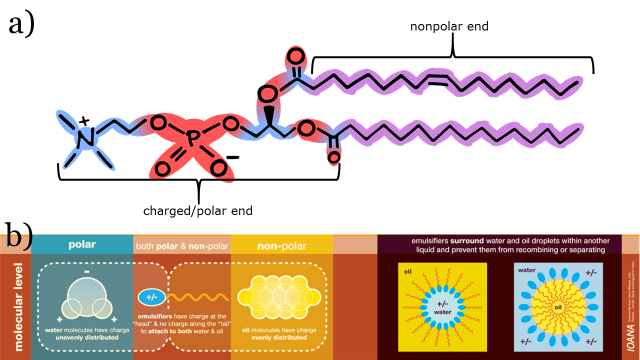 Emulsifiers are amphipathic compounds, meaning the molecule has both a polar and nonpolar section [Figure 2]. Common food emulsifiers include egg yolk, soy lecithin, garlic, and mustard. Egg yolk contains the emulsifying agent lecithin. The vegan version is isolated from soy and is thus known as soy lecithin. Lecithin is a commonly used emulsifier in many other food products, such as chocolates, mayonnaise, and Hollandaise sauce. Amphipathic compounds found in garlic include diallyl sulfide, allyl methyl disulfide, and diallyl trisulfide . Mustard, the condiment, is made from mustard seeds. Emulsifying agents in the condiment, such as the pectin rhamnogalacturonan, originate from the mucilage of mustard seeds, a thick, glutinous layer that surrounds the seed hull [2,3]. a) Lecithin is an example of an emulsifying agent. b) Emulsifying agents stabilize emulsions by interacting with both the polar and nonpolar compounds. (b) adapted from Ioana.Blog. So with a helping hand from emulsifiers, homemade vinaigrettes can still be as simple yet elegant as they seem, and best of all, ready to serve whenever. In a bowl, whisk together the vinegar, garlic, mustard, salt, pepper, and oregano until well mixed. While still whisking, slowly add the olive oil. When a stable emulsion forms, serve with salad or store in a covered bowl or bottle. Kimbaris, A.C., Siatis, N.G., Pappas, C.S., Tarantilis, P.A., Daferera, D.J., Polissiou, M.G. Quantitative analysis of garlic (Allium sativum) oil unsaturated acyclic components using FT-Raman spectroscopy. Food Chemistry, 2006; 94: 287-295. Cui, W., Eskin, M.N., Biliaderis, C.G., Marat, K. NMR characterization of a 4-O-beta-D-glucuronic acid-containing rhamnogalacturonan from yellow mustard (Sinapis alba L.) mucilage. Carbohydrate Research, 1996; 292(1): 173-183. Leroux, J., Langendorff, V., Schick, G., Vaishnav, V., Mazoyer, J. Emulsion stabilizing properties of pectin. 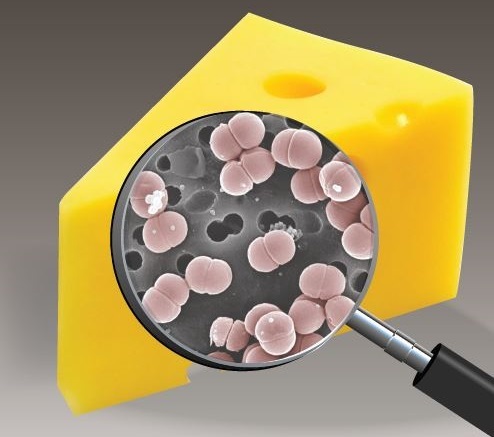 Food Hydrocolloids, 2003; 17: 455-462. 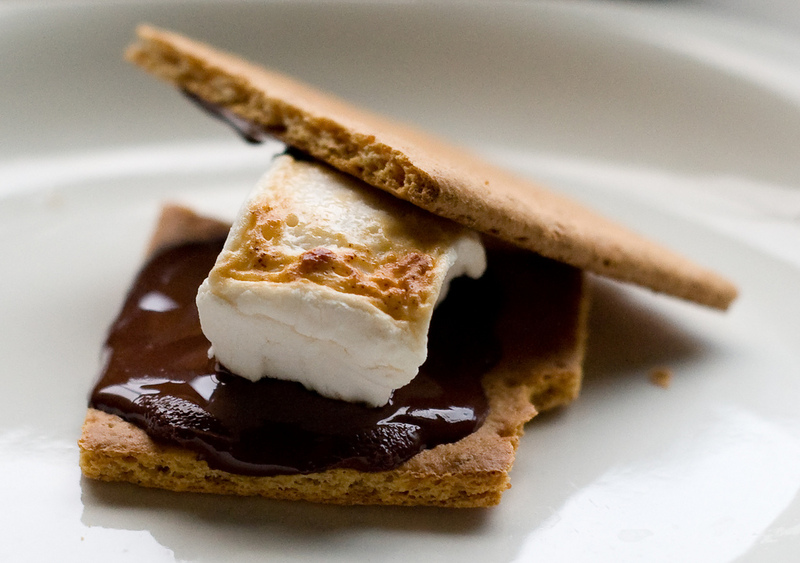 Whether you prefer them toasted over a campfire, bobbing in a cup of hot chocolate, or roasted over a bed of sweet potatoes, marshmallows are an ooey-gooey fluffy treat that just finds a way warm the cockles of your heart. 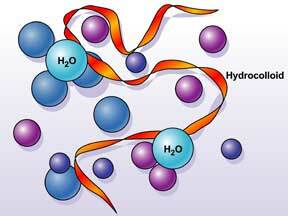 Their ability to bind to water molecules makes them hydrophilic (or “water-loving”), and their ability to remain suspended and dispersed evenly in the water (without settling to the bottom) makes the substance a colloid. Thus, food gums are hydrophilic colloids, or hydrocolloids. Gelatin makes marshmallows chewy by forming a tangled 3-D network of polymer chains. Once gelatin is dissolved in warm water (dubbed the “blooming stage”), it forms a dispersion, which results in a cross-linking of its helix-shaped chains. The linkages in the gelatin protein network, called “junction zones” trap air in the marshmallow mixture and immobilize the water molecules in the network . The result? The famously spongy structure of marshmallows! This is why the omission of gelatin from a homemade marshmallow recipe will result in marshmallow crème, since there is no gelatin network to trap the water and air bubbles. And for the gelatin-averse, worry not! There are indeed many hydrocolloid alternatives to gelatin. 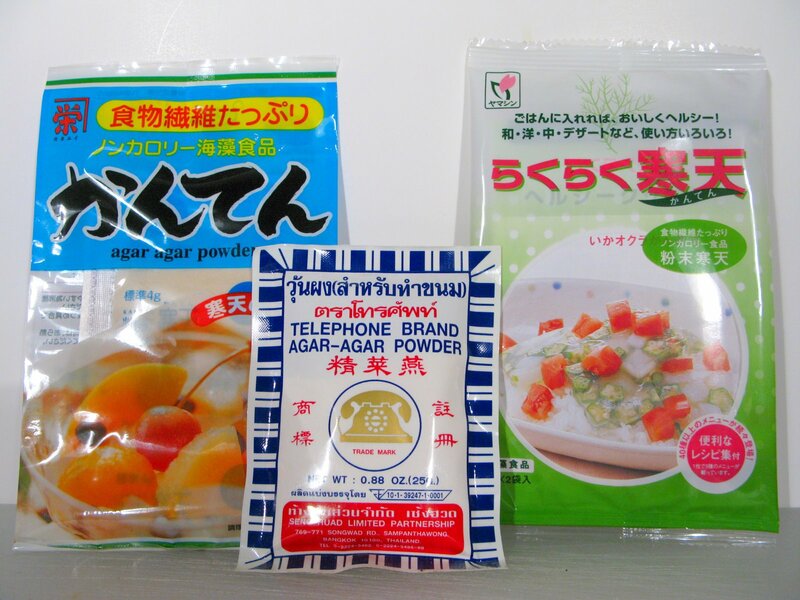 However, since gelatin has so many different functions (gelling agent, emulsifier, stabilizer, thickener, etc. ), its alternatives are not universal. Rather, substitutes are specific to each specific food application. In our case, some have suggested pectin – a polysaccharide from the cell walls of plants – as the ideal replacement for gelatin in marshmallows . Agar agar is a commonly used vegetarian alternative for jellies. * Note: Carrageenan gels are unique in that their melting temperature can be modified, depending on the solution concentration of the carrageenan and the presence of cations, so its melting temperature ranges from 40°C (104°F) and 70°C (158°F). 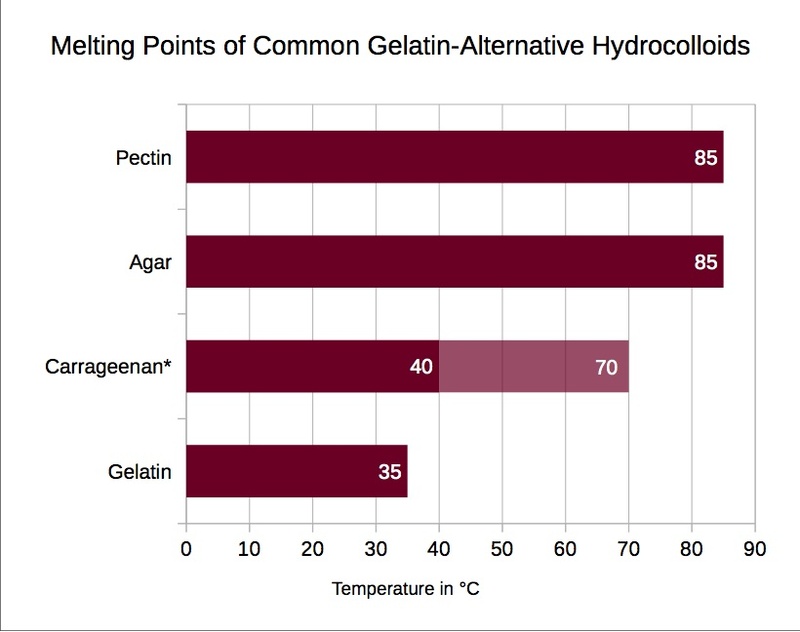 As you can see, none of the gelatin alternatives have the appropriate melting temperatures to replicate gelatin’s melt-in-your-mouth sensation. However, this does prove advantageous in the fact that they can last longer on hot days or in hot, tropical climates and they do not require refrigeration to set. Prepare pans and equipment: Spray the baking pan with cooking spray. Use a paper towel to wipe the pan and make sure there’s a thin film on every surface, corner, and side. Set it near your stand mixer, along with the kitchen towel and spatula. Fit the stand mixer with the whisk attachment. * NOTE: You can add about 1 tablespoon of powdered flavorings to your hydrocolloid while it is blooming in the water. Combine the ingredients for the syrup: Pour 3/4 cup water into the 4-quart saucepan. Pour the sugar, corn syrup, and salt on top. Do not stir. Bring the sugar syrup to a boil: Place the pan over medium-high heat and bring it to a full, rapid boil — all of the liquid should be boiling. As it is coming to a bowl, occasionally dip a pastry brush in water and brush down the sides of the pot. This prevents sugar crystals from falling into the liquid, which can cause the syrup to crystallize. If you don’t have a pastry brush, cover the pan for 2 minutes once the mixture is at a boil so the steam can wash the sides. Do not stir the sugar once it has come to a boil or it may crystallize! Boil the syrup to 247°F to 250°F: Clip a candy thermometer to the side of the sauce pan and continue boiling until the sugar mixture reaches 247°F to 250°F. Take the pan off the heat and remove the thermometer. Whisk the hot syrup into the gelatin / agar: Turn on your mixer to medium speed. 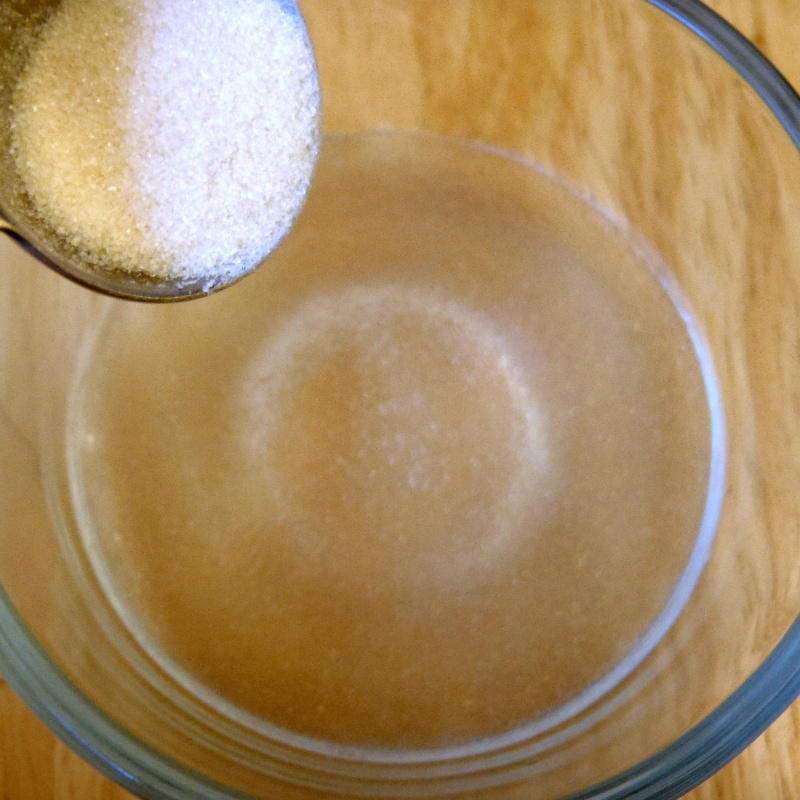 Carefully pour the hot sugar syrup down the side of the bowl into the gelatin or agar. The mixture may foam up — just go slowly and carefully. Increase speed and continue beating: When all the syrup has been added, cover the bowl with a clean kitchen towel and increase the speed to high (the cloth protects from splatters — the cloth can be removed after the marshmallows have started to thicken). Beat marshmallows until thick and glossy: Whip for about 10 minutes. At first, the liquid will be very clear and frothy. Around 3 minutes, the liquid will start looking opaque, white, and creamy, and the bowl will be very warm to the touch. Around 5 minutes, the marshmallow will start to increase in volume. You’ll see thin, sticky strands between the whisk and the side of the bowl; these strands will start to thicken into ropes over the next 5 minutes. The marshmallow may not change visually in the last few minutes, but continue beating for the full 10 minutes. When you finish beating and stop the mixer, it will resemble soft-serve vanilla ice cream. 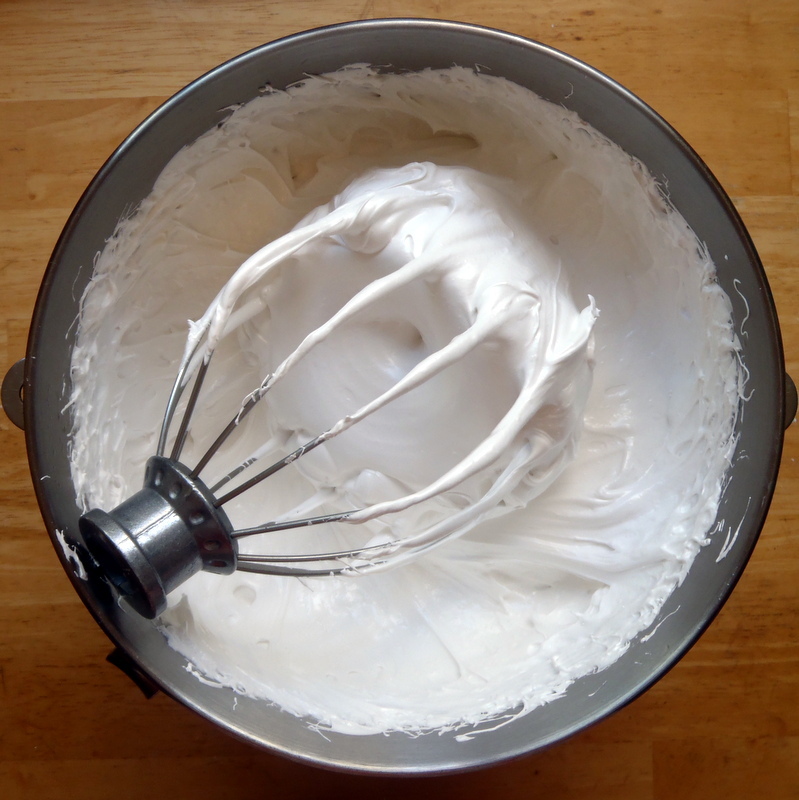 Immediately transfer to the baking pan: With the mixer running on medium, slowly lift (or lower, depending on your model) the whisk out of the bowl so it spins off as much marshmallow as possible. Using your stiff spatula, scrape the as much of the thick and sticky marshmallow mixture into the pan as you can. * NOTE: If you want mini marshmallows, after mixing, immediately put the mixture in a piping bag and pipe out your mini marshmallows in the size and shape of your choice. Let the marshmallows set for 6 to 24 hours: Spray your hands lightly with cooking oil and smooth the top of the marshmallow to make it as even as possible. Let the mixture sit uncovered and at room temperature for 6 to 24 hours to set. 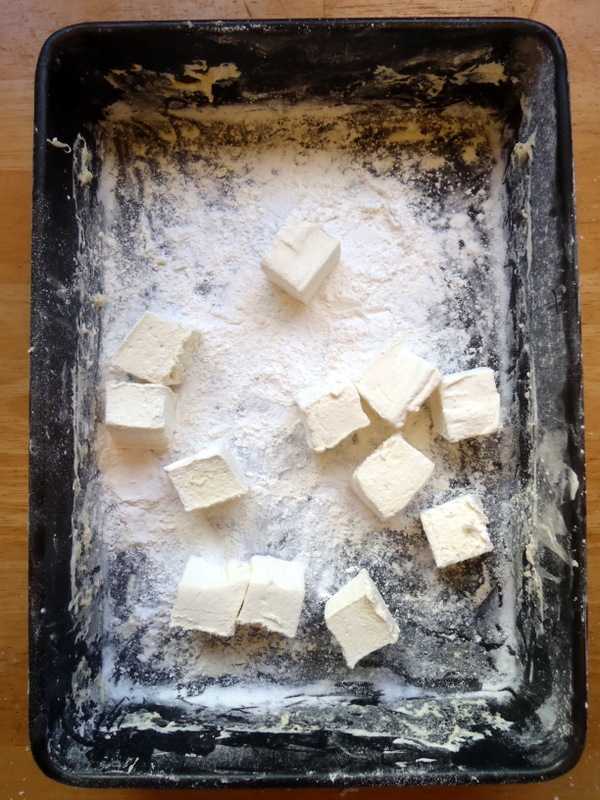 Prepare the marshmallow coating: Combine the powdered sugar and cornstarch in a bowl. Remove the marshmallows from the pan: Sprinkle the top of the cured marshmallows with some of the powdered sugar mix and smooth it with your hand. Flip the block of marshmallows out onto your work surface. Use a spatula to pry them out of the pan if necessary. Sprinkle more powdered sugar mixture over the top of the marshmallow block. 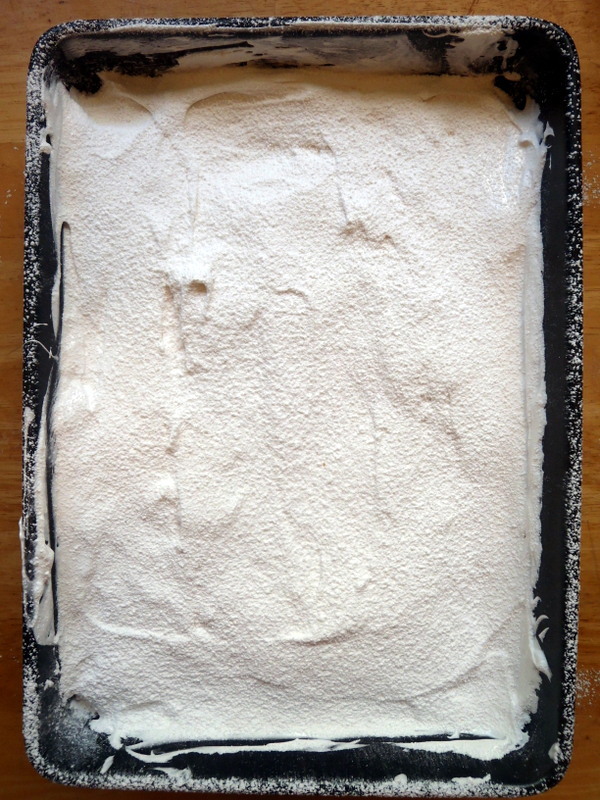 Coat each square with powdered sugar mix: Toss each square in the powdered sugar mix so all the sides are evenly coated. 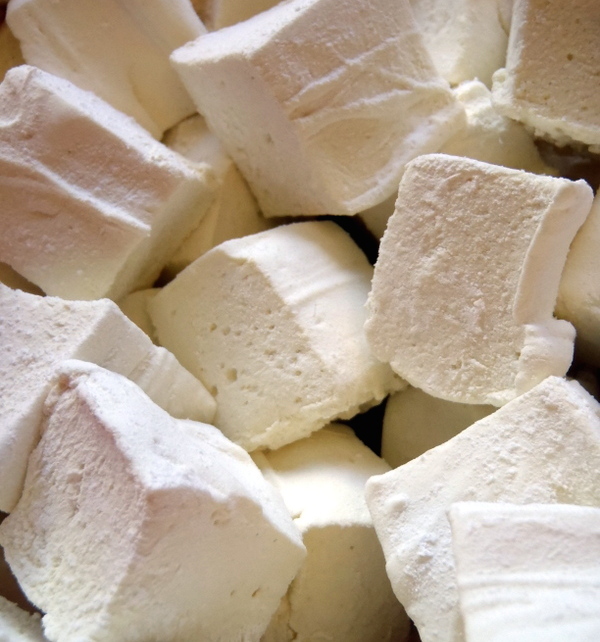 Store the marshmallows: Marshmallows will keep in an airtight container at room temperature for several weeks. Leftover marshmallow coating can be stored in a sealed container indefinitely. Add Flavorings: You can add about a tablespoon of either powdered or liquid flavorings/food colorings to the marshmallows at Step 2 or Step 8, respectively, in the recipe. Add citric acid or cream of tartar to stabilize the inverted sugars in your recipe and prevent them from crystallizing, essentially ensuring that your marshmallows remain fluffy and chewy. 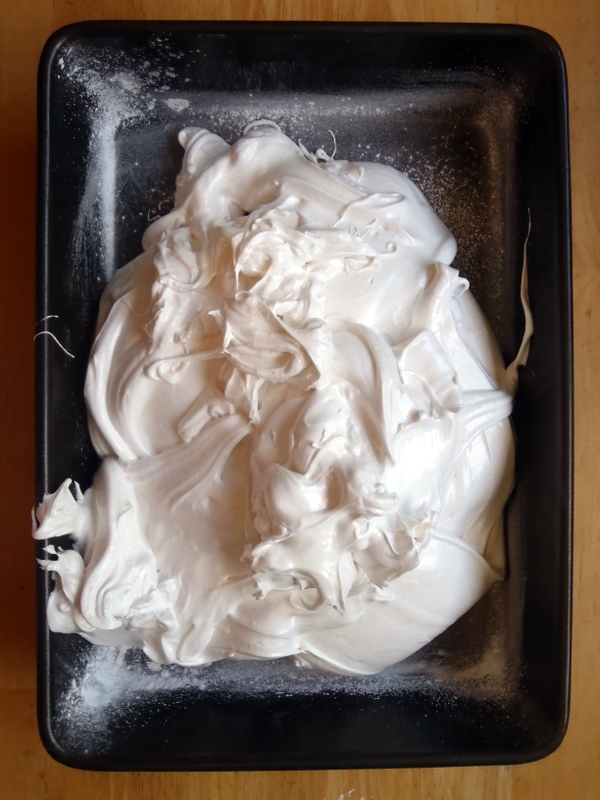 Add your sugar syrup into whipped egg whites to incorporate extra air volume and structure for spongier, pillowy marshmallows. DIY Lucky Charms: You can make your own dehydrated marshmallows, similar to the ones found in breakfast cereals (but without all the suspicious additives) by evaporating the water from the sugar solution in your homemade marshmallows. Various methods are described here. Saha, D., Bhattacharya, S. Hydrocolloids as thickening and gelling agents in food: a critical review. Journal of Food Science and Technology. December 2010; 47(6): 587-597. Karim, A. A., Bhat, R. Gelatin alternatives for the food inudustry: recent developments, challenges and prospects. Trends in Food Science & Technology. December 2008; 19(12): 644-656. Gelatin. Gelatin Food Science. 14 Dec. 1998.